We believe that every photographer who enters one of our competitions deserves thoughtful feedback on their work. 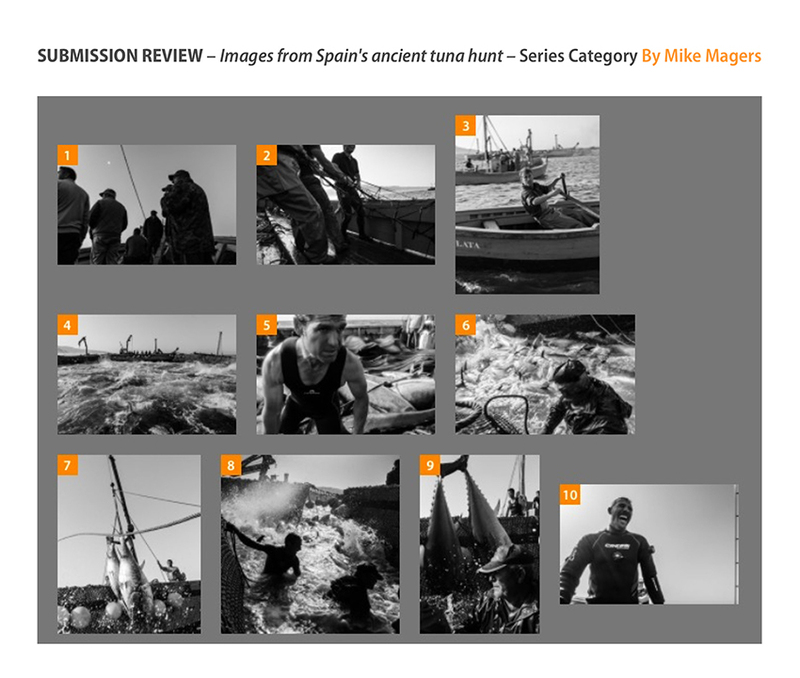 Our Submission Reviews are designed to help you be more successful in future photo competitions. 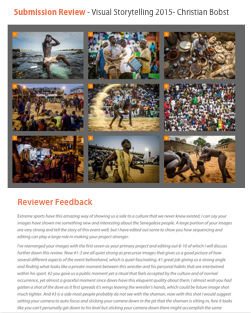 This is an opportunity for you to receive critical and constructive feedback on your photography from top photo editors, curators, publishers, gallerists, educators, critics, consultants, and other industry professionals. 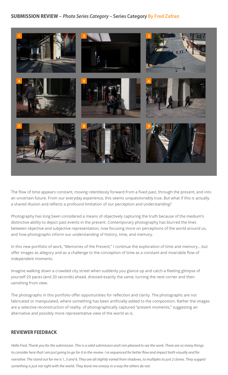 Just by entering a series or 5+ single photos in the LensCulture Street Photography Awards 2019 you can get a free submission review. This review was extraordinarily insightful and immensely helpful. Truly, I didn’t anticipate this level of attention or erudition, and commitment to helping artists who were not competition winners or finalists. I am extremely grateful … and encouraged. My thanks once again! Meaningful critiques for photography competitions – what worked well in your entry and what can be improved. 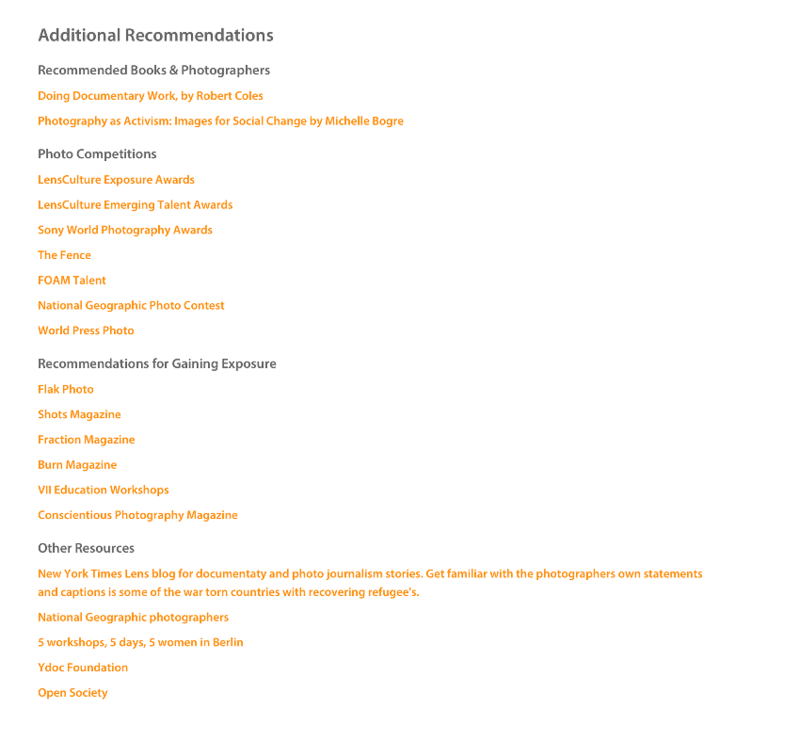 Personalized recommendations for improving your submissions. Tips and strategies for getting your work seen in more places, more often. 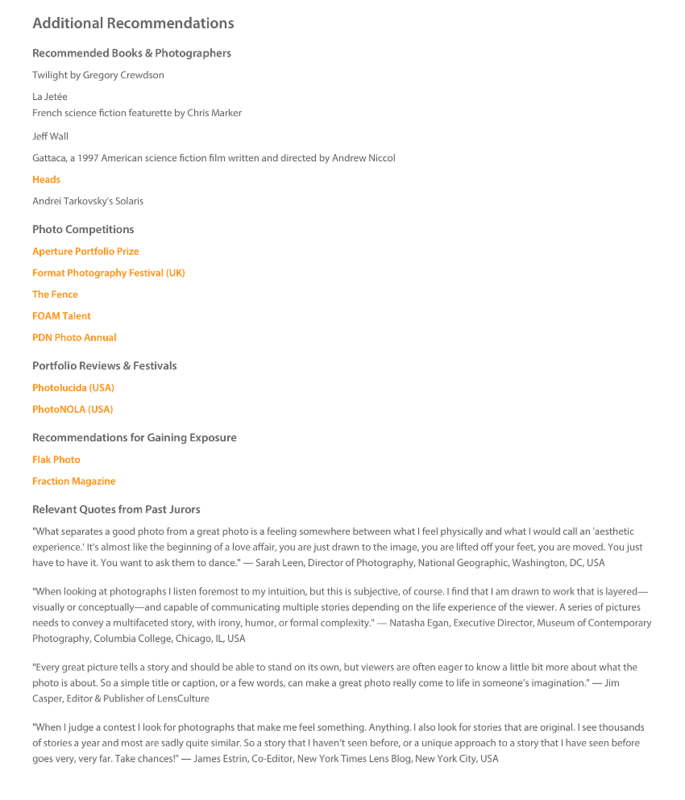 This is not a portfolio review, which is typically broader and more in depth, nor is it a review of your submission for publication on LensCulture (our editors are not involved). LensCulture knows the power of photography competitions as opportunities for recognition and exposure that can launch careers and move your work forward, both creatively and professionally. 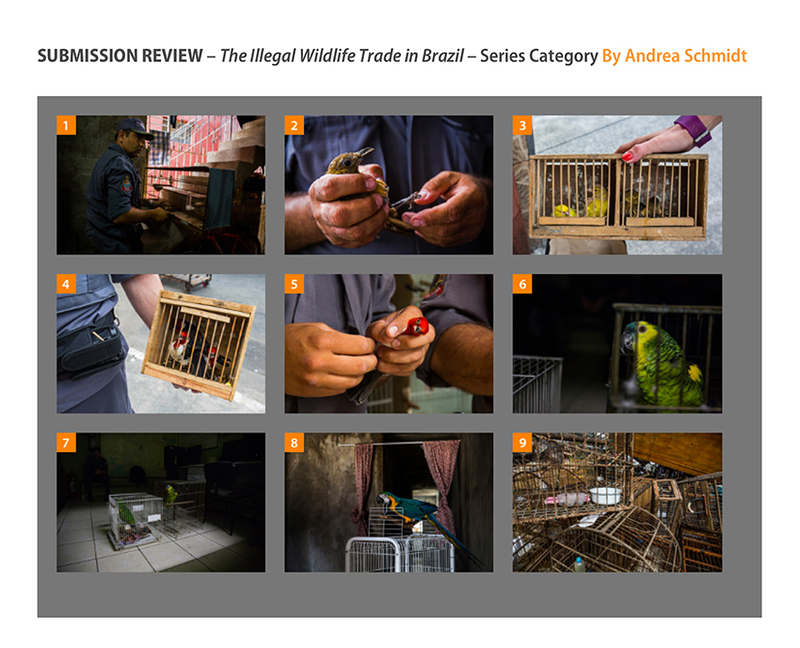 Whether you're winner or a finalist, or neither, our submission reviews are a worthwhile experience for every participating photographer. 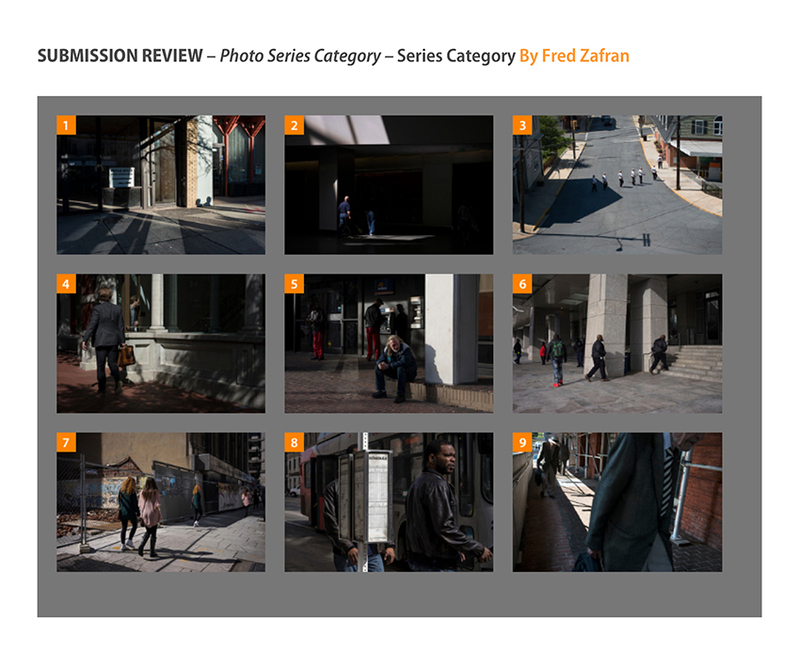 Submission Reviews will be completed AFTER the Street Photography Awards 2019 Deadline. You need to submit your entry by April 24, 2019 to get a free submission review. The review of my project, was thoughtful, honest and inspiring. Thank you to the team at lensculture. Often, as a documentary photographer, I am working on my project alone, and I am so personally invested in it that I NEED to have someone critique my projects and tell me what is working and — most importantly — what is NOT working. It means a lot to me. Thank you! Thank so much. Best constructive feedback I have received. I very much appreciate the positive feedback. 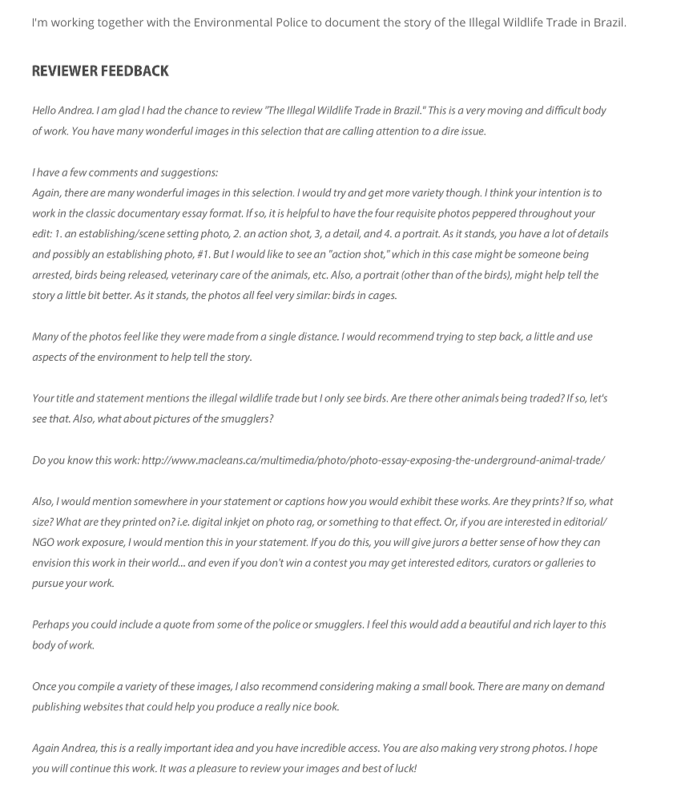 I can see that the reviewer actually took the time to look into my photographs and not just at the surface. Thank you and thanks also for the technical tips. Wow! Thank you the review. I must say it was far more detailed and insightful than I expected. 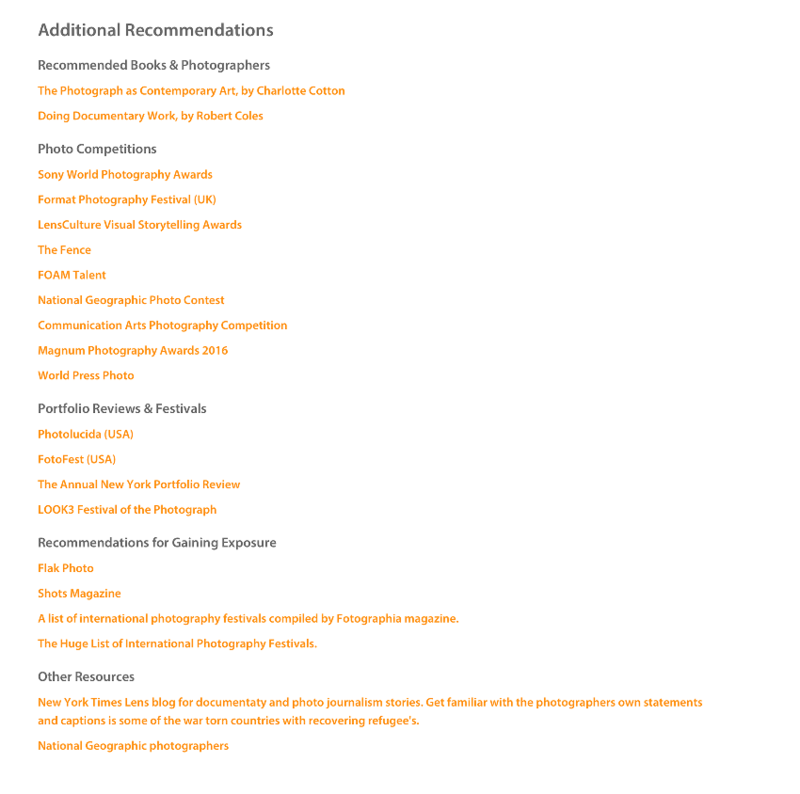 I found all the comments relevant and helpful and your inclusion of references to other photographers and other competitions showed a real grasp of the style of my work and the relationship to other photographers. A 5 star review. Thank you!! Thank you very much for your balanced, positive and encouraging review. I really appreciate the honesty and sincerity, and your suggestions are things I can easily implement by taking a little more time with my shots. Knowing what were my strongest shots and how to improve them gives me a great starting point to work from in improving my work. Again, thank you for your thoughts, time and attention. Many thanks for the review that came with my submission to this year’s Exposure Awards. It was very useful and in greater depth than I had imagined it would be. When we assess our own work we can lose objectivity in the process. At first I thought how can you criticise my baby but then I went back and looked at my submission through the eyes of the reviewer and thought they were absolutely right and why hadn’t this occurred to me before? The advice given was incredibly valuable and I intend to follow up on it. Thank you again. 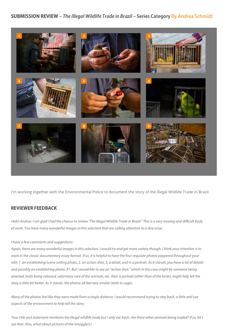 I submitted to the Exposure Awards 2015 competition and wanted to write a note of appreciation for the excellent review provided of my work. The review was extraordinarily insightful and immensely helpful. Truly, I didn’t anticipate this level of attention or erudition, and commitment to helping artists who were not competition winners or finalists. I am extremely grateful … and encouraged. My thanks once again! A heartfelt thanks to the reviewer who took the time to leave such a detailed review of my food photographs. This is the first time I have had my work critiqued by someone other than a friend or casual Facebook follower. I really appreciate the feedback and like that I have some concrete things to work on. Now I have a "To Do" list! Once again, thank you. I am grateful. Hi, I just wanted to write and say thanks for the great review and constructive criticism -- that especially helps! It's always a good idea to have a new, unbiased pair of eyes look at your work, especially when you've been focused for so long on it that you can lose sight of the bigger picture. Getting this free(!) review has been very helpful, especially as it came from someone who seemed to really understand my work and is very knowledgeable in the field. Rather then click “Say Thanks” I wanted to let you know that for me it’s been a game changer. The review and suggestions were thoughtful as well as very helpful. It inspired me to visit the Met again and try to see things from a slightly different perspective, with a few of the results at the moment looking as though they are “keepers.” Keep up the great work. 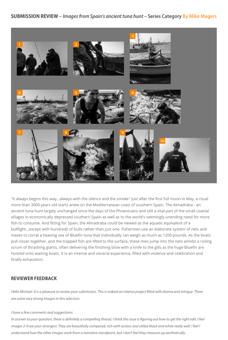 Thanks so much for the thoughtful feedback on my entry for the LensCulture Exposure Awards. 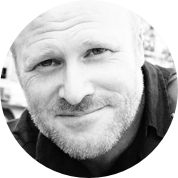 It was personal, insightful and encouraging, and the resources provided are all great — many I was not familiar with. To receive this level of feedback from an award entry is truly amazing. Thank you for this, and thank you for supporting photographers in such a valuable way. 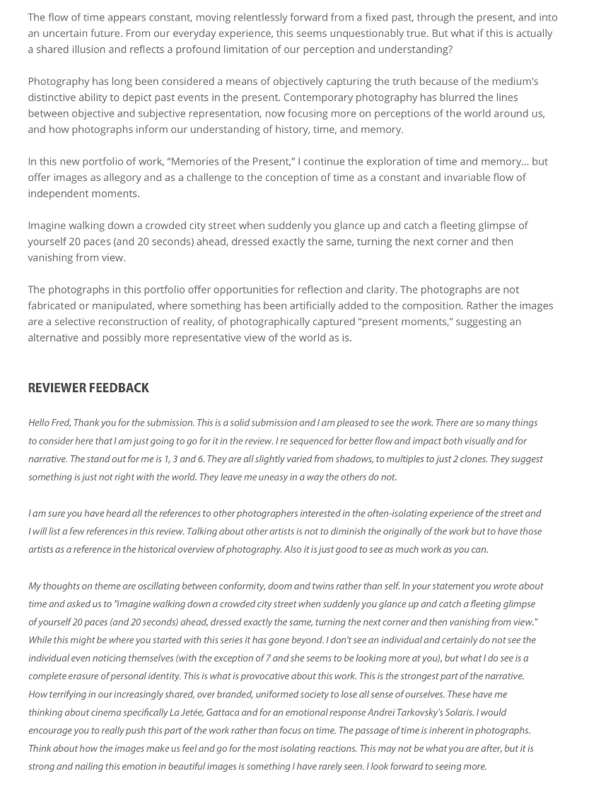 I just wanted to say thank you for the review of my submission ‘Photographers’. The information was really helpful and it’s refreshing to read such a considered critique by someone who is obviously visually literate and has taken the time to not just look at the pictures but to see them. The suggestions of where to go next are particularly useful. I am very touched and impressed by the honesty, authenticity, and true critique of my work. I know how many submissions you get and really want to thank you for truly taking time, seeing our work and giving heartfelt and worthwhile feedback. Thank you again. You went above and beyond what I expected. Thank you for your feedback and for taking the time to write it concisely and fairly. 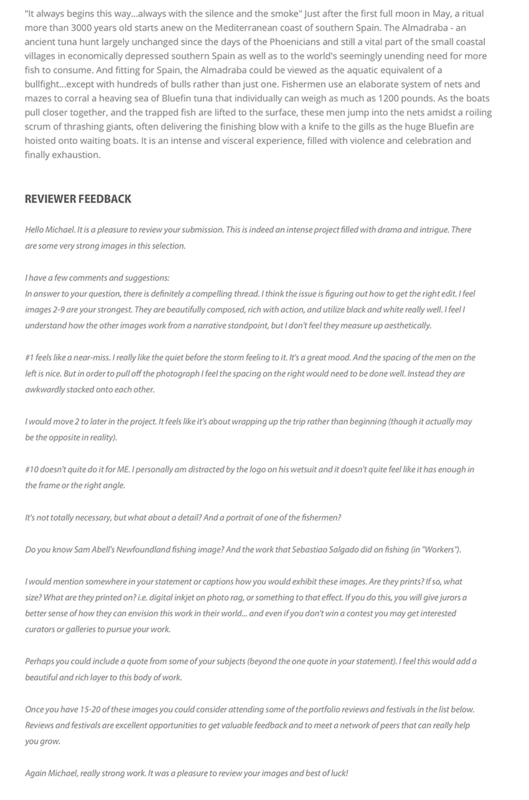 This is the first time I have ever had my 'personal' images reviewed (I get feedback from my employer but that's for a very different type of photography) so it has been good to read and find out your thoughts, and also given me a lot of useful advice. This feedback was much more comprehensive than I expected to receive and truly helpful. I could immediately see how the suggestions would improve both my individual photographs and how I presented them as a series. Very much appreciated. I would like to thank your reviewer for such a thoughtful and considered review and I would like to thank Lens Culture for producing this possibility. This advice will be useful not only at the editing and presentation stages, but also be important during the shooting. It is a wonderful opportunity to be offered such a constructive perspective on one's work. Thank you for the review! It's often very difficult to find honest, constructive feedback. I felt like the review was thoughtful and very helpful. It not only helped me understand how to improve my contest entries, but also my portfolio editing and writing. Thanks again. The feedback is priceless! The Review felt like the reviewer offered personal and heartfelt insights along with appreciation, guidance and critique..thank you. I will make use of the suggested reading list. I am learning as quickly as I can as slowly as I need to and am amazed every day. Thanks for the thoughtful and considered review. As a photographer and a control freak, it's super useful to put myself in listening mode, and hear what someone seeing my work on a monitor (rather than the large scale prints) sees. It will certainly help me focus on my artist statement, for if a reviewer reads and understands one thing, and I mean something a bit different, it's my job to clarify. Glad for this opportunity, unique in my experience. It's so invaluable to have a professional review of my work and certainly helps enormously with my work moving forward. Thank you so much for taking the time and your comments are very constructive. Thank you so much for this thoughtful review. It feels as though you really studied these images and you took the time to look at my other work in this series - which I appreciate very much! Your constructive comments help me to see how I present my work and feel confident in moving forward positively with my future submissions. Thank you for your review - a first for me... I find choosing photos for a series the most difficult task of all and pointing out which photos were weak and which were strong within the context of the series, and why, was important to hear. Thank you very much for such a comprehensive review. It was very helpful to further understand the strengths and weaknesses of my submission. Your feedback creates a stronger foundation for me to grow as a photographer! I just wanted to say thank you very much!! This review helped me much more than I was expecting!! I was a bit lost selecting the photos for this portfolio, and now I have a better idea on what to do and how to proceed with this idea! Again, thank you!! !